I am of Irish descent through both my mother and my father’s side of the family. 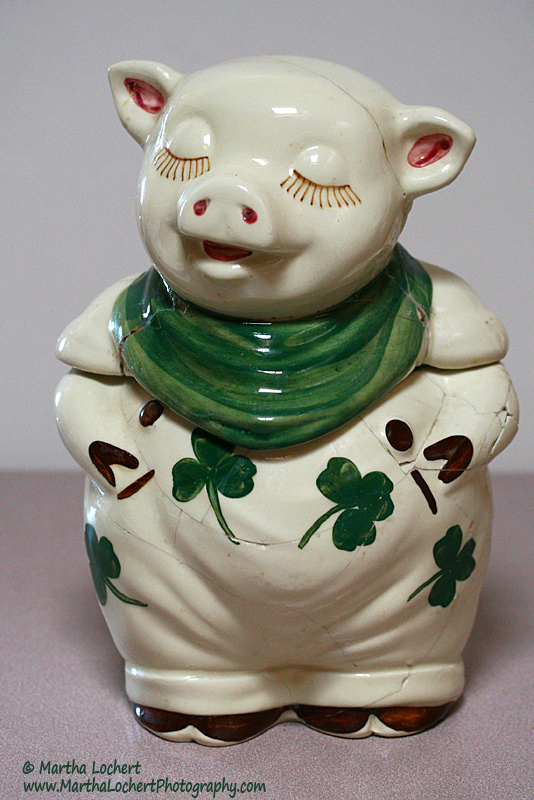 Every St. Patrick’s Day my mind fills with memories of my paternal grandmother Cecile Margaret Catherine McKeon and her ever-present cookie jar from which we all sneaked cookies. Decades ago it was affectionately named Paddy Pig. I don’t know when Paddy joined our family, but I know he has been around since at least the early 1960’s. Poor Paddy has taken a beating over the years. Though broken on numerous occasions, he’s always been patched back together so that the next generation can enjoy his happy smile and stay connected in some small way to the Irish roots we have. As crudely patched as he is, he’s one of the family and no one can bring themselves to throw him away; he represents too much. He sits on a shelf in my kitchen now, but when I get him down and lift his head, I know I’m replicating the same action my relatives did for at least fifty years and it keeps their memories in my heart. His broken, yet mended state of being is somewhat of a metaphor for life and the struggles we can face. Although our expectations are sometimes crushed and the people we draw near disappoint us, we are resilient, piece ourselves back together and forge ahead with the optimism of a new day and a new dream. May you find some joy and inspiration in this happy little patched piece of porcelain on this St. Patrick’s Day and always. Texas Canyon, which lies about twenty miles east of Benson in southeast Arizona and easily accessed from I-10, is full of huge granite boulders. This one rests at the south end near the Amerind Foundation and, as many of them are, is precariously balanced in a way that seems to defy gravity. I planted my first apple trees last April. They are still sweet little four-foot popsicles, but apparently they like where I planted them because they started budding a few weeks ago and are now in full bloom. It isn’t officially spring, but it is in Tucson – and the varieties I planted (Dorsett Golden and Anna) are early bloomers. When I planted them last year, I figured it’d be four or five years before they’d get their feet in the ground and start producing apples, but who knows; they are covered in flowers, so maybe I’ll get some already. The calming beauty of another lovely Arizona sunset. Even when they are simple, they are beautiful. Enjoy your weekend. Image copyrighted. Contact Martha Lochert for licensing. It’s Valentine’s Day, but this day is not just for sweethearts. It is a celebration of love – for all who have a heart to give and receive love. May you share your love and accept love back on this and all days. This photo was made at the Sweetwater Wetlands in Tucson, Arizona. It is lush with swamps and marshes, wild birds, dragonflies and other critters. I walked out on my porch and this beautiful little hummingbird was taking a rest. I thought he was hurt, since his wings were out. Usually the hummers fold their wings in close to their bodies when they stop flying. He patiently awaited while I went in to get my camera, then crouch down and move within inches to make pictures of him. He allowed me to snap a couple images and then he flew away. I guess he was just tired. What a treat for me! Another New Year’s Eve is upon us and it seems the overwhelming consensus is that 2016 can not end soon enough. There seems to have been a disproportionate amount death this year – and I am not just reacting to all the celebrities who have passed (and there have been a lot), but I have known many, many people who passed away this year. My friends have experienced the same thing. So, here’s to a better year in 2017 – with fewer deaths, and way more happiness. As always, please be safe if you are out this evening and call a cab if need be. Your life is important to more people than you realize. A walk in the woods is liken to a nice cup of hot tea. It replenishes the spirit and soothes the soul. Image copyrighted and registered with US Library of Congress. Any use requires licensing from Martha Lochert. A detail of the beautiful Spanish Colonial architecture on the “White Dove of the Desert” – Mission San Xavier del Bac – founded as a Catholic Mission by Father Eusebio Kino in 1692. It is the oldest intact European structure in Arizona, built 1783 to 1797 by Ignacio Gaona and his native American O’Odham workforce. Image copyrighted & registered at US Library of Congress. Any use requires licensing from Martha Lochert. This election has been ugly and divisive. Others have been. Others will be. Social media allowed everyone to be a campaigner and push their opinions, and mis-information, which made it all the more ugly. Certain individuals felt they could somehow sway their “friends” by name calling, and basically, insulting their intelligence. Others voiced their opinions from a much more mature position of civil discourse. Most kept out of it all together, realizing their opinion was their own and it was up to each voter to get the facts, not from them on Facebook, as though they were the bearer of all knowledge. Social media has given a voice to would-be reporters who have no credibility. Opinions are not facts. I will not comment on what the results of this election mean – from one perspective or the other. I just know that part of this country is in shock, another elated and a third didn’t like any of their options, but voted what they felt was the lesser of two evils. All need to come to center and be examples to the world of how, in this country, we will defend each others right to differing opinions, though they be vastly opposing our own. So I will just post this: a rose – perfect in the harmony of its design, uplifting in its beauty, neutral in its reality. … the sculptural beauty of the fallen leaves. Early October is harvest time for grape varietals in southern Arizona. Most people think desert when they think of southern Arizona, but the Elgin, Sonoita and Willcox areas – where elevation is higher at 4300 – 4700 ft. – is perfect for vines. There are numerous vineyards to visit and enjoy an afternoon of tasting. Just what is lichen? It’s the symbiotic union of algae and fungus, with fungus being the dominant partner. Its combined form is different from either the fungus or algae. Some varieties cling to rock surfaces and grow in a carpet-like state, while others branch out from the surface of damp wood in a more three-dimensional form. It fascinates me how similar lichen growing the woods looks like coral in the ocean. Image created at ISO 200 – 1/200 sec. at f4 with a Canon 60mm macro and a subject to lens distance of about 8 inches and open shade under the forest canopy. Bee exoskeleton on a rosemary plant – photo by Tucson photographer Martha Lochert. Bees and other insects like cicadas have their skeletons on the outside of their bodies (exoskeleton). So when they are ready to grow, they molt. The process begins with them taking on air, water or raising their blood pressure. Once the shell is detached from the muscles and internal organs, the insect can climb out – with a new exoskeleton ready to protect its internal organs. In honor of all who perished on that horrible morning fifteen years ago – of all nationalities – and all who put themselves in harm’s way to save the lives of others. We do still mourn. There is a welcome, distinctive smell in the desert when it rains, which comes from the creosote bush (Larrea tridentata), shown here. Columbine (Aquilegia) growing by an aspen tree in southwest Colorado. The blue columbine, also referred to as the Rocky Mountain Columbine-White and Lavender species, is the state flower in Colorado, but the genus includes 60-70 species of high-altitude-loving perennials. On a path in the canyon, next to Oak Creek, sits a strange little assemblage of rock piles in the cool of the early evening light. In the secluded, quiet space and soft light the stacks seemed animated – as if they had assembled to wait for communication from the mother ship! It was magical. Brothers – on their way to the East Fork of the Cimarron River in southwest Colorado. Life is good. Saguaro and skyline at night by Tucson photographer Martha Lochert. I like the latent tension in this photograph between the peaceful glow of the city lights and the painful needles on the saguaro cactus. It’s a sort of commentary on life in Tucson. Those of us who live here are ever-vigilant to not get poked; not get dehydrated; not get sun stroke; not get bitten by scorpions or snakes – and yet, we have a laid-back, no worries, peacefulness to our city. I love making Gazpacho, but I find that every time I make it, I serve way too much. I can eat a huge bowl full, with a hunk of crusty bread, and call it a meal, but the average person doesn’t, in my experience, want that much soup. They would prefer the soup not be the main course, but rather, an accent side dish to go with other things. So here’s a creative way to serve a small portion of gazpacho, to go with whatever the plated main course will be. This is also a fun way to fancy up a happy hour gathering. My recipe follows, so feel free to give it a try. Chilled gazpacho is a great summertime meal. Image copyrighted. To avoid infringement, licensing is required by Martha Lochert for any use. Combine all ingredients in a large bowl, stir and chill for at least three hours before serving. It’s good cold and the longer the flavors meld together the better it tastes, so I always make mine first thing in the morning for serving at dinner. Have hot sauce on the table, so guests may add more spice, if they like things hotter. *As an option, you may want to puree about ¼ or so of the batch, then stir into the rest, to create a thicker base. *Another option is to add cooked cocktail shrimp – if your guests aren’t vegans or have seafood allergies. Photo by Tucson photographer Martha Lochert of a hiker crossing Soberanes Creek on the Soberanes Canyon Trail in Garrapata State Park, CA. My daughter is getting married in Carmel, CA in October, so we have been watching the Soberanes Fire closely, ever since it started and her soon-to-be in-laws were evacuated from their Carmel Highlands home, which sits very close to the wedding venue. Luckily they are safe and have another home to go back to in Chicago and thus far, their Carmel home has been spared, as the fire has moved southeast of them. Many forest fires start by lightning strikes, but yesterday investigators determined that this fire is the result of an unattended campfire. http://cdfdata.fire.ca.gov/incidents/incidents_details_info?incident_id=1348 This discovery makes me sick. We hiked in Garrapata State Park (where the fire originated) in February – along the Soberanes Canyon Trail, crisscrossing the Soberanes Creek and walking among beautiful redwood trees that are now charred. I’m saddened that I can not take that hike and enjoy the beauty of that place again when we are there in October. My photographs are cherished memories of a pristine landscape that no longer exists. On our annual 2-3 week camping trip last month I put out an abandoned fire in Colorado. I saw the car drive away, then looked over and saw their fire pit billowing smoke. They blatantly left it smoldering. Last year I had to do the same thing in another part of Colorado. Why do people think that if it’s within a fire ring it’s OK to leave smoldering wood? No flames, does NOT mean no fire! Not only can a wind spread sparks and start a forest fire, but if the bed of a fire pit is hot enough, underlying roots can smolder for weeks before erupting in a fire. If you don’t make sure a campfire is dead out, you may unknowingly be the cause of a forest fire! Seriously – drench your fires when done. You should be able to put your hand in the fire pit before you walk away. In the case of the Soberanes Fire, the campfire was started in an area where fires are not even allowed, but selfishly, whoever started it, ignored the notice and chose to have a fire at a scenic spot by a waterfall, because they wanted to! Now 107,479 acres (44,300 at the time of my original post) are charred, 57 homes are destroyed, one man is dead and an exquisite landscape is ruined for the next several decades. Image copyrighted. No use granted without licensing from Martha Lochert. … because sometimes just pausing to enjoy the simple beauty of a rose is all we need. Image copyrighted & registered with US Library of Congress. Any use requires licensing from Martha Lochert. This post is for the photo hobbyists I teach. Don’t be afraid to use motion to your advantage. Yes, we want to capture clear and stunning photos, but sometimes showing motion is the very thing that adds interest to a photo and makes it transcend a sterile documentation of an object. I could have photographed this roulette wheel with an on-camera flash and a normal or fast shutter speed and documented it, but that’s all it would be – a nice clear picture of a roulette table. The numbers on the wheel would all be visible and static; the marble would hover on the edge, appearing to be stationary. Instead, I opted to try and capture the excitement of the game by using a higher ISO (800) which allowed me to use ambient light instead of an on-camera flash. I also used a fairly wide aperture (f4.5) to keep most of the table out of focus and a slow speed (1/8th of a second) so that the wheel would move during the exposure. Had I more time, I would have worked on perfecting this shot by using a tripod instead of hand-holding, but I did this during a party I was hired to photograph and didn’t have more time to spend on it. Even as is, I think it tells a much better story than snapping a crisp, yet boring image. It’s more dynamic now, since it captures the action of the game. So allow motion to be recorded in your photographs when it makes sense. After all, photography captures the passing of time within a two-dimensional plane. Broods in other parts of the country are on a periodic cycle, only emerging every 17 years! According to CNN http://www.cnn.com/2016/04/17/us/cicadas-northeast-17-years/ the northwest is experiencing a huge influx of cicadas after their brood emerges from its 17-year cycle. There are also proto-periodical broods which are active every year, but on certain years come out in extra large numbers. The cicadas only live two to four weeks after emerging, so those who can’t stand their song, have patience, while the photo geeks have fun finding and photographing them! It’s going to be a scorcher this weekend in Tucson, Az with projected temps of 110 degrees. Stay hydrated, my friends! Image copyrighted. Use requires licensing. Somebody asked me how to photograph ceramics. There’s not one answer to that question. Here are a few samples of options I have chosen. The first is a Raku urn by Joni Pevarnik that I photographed. I placed that on a 6 foot piece of textured art board, curved to create a seamless background, and added a diagonally projected background light to add drama. That had lights above and to the sides in front. The clay art piece, also by Joni Pevarnik, had a lot of textural “folds” so I lighted that from above and behind with a huge (approx. 4 foot) soft box and bounce cards to fill the front. There were no lights in front. This created a beautiful soft light quality and showed the roundness of the base, by allowing the bottom to be in shadow. I also threw in a small light at the right to keep the background from going too dark, placing it behind the piece, but such that some of the light would spill onto the edge to create a bit of rim light. For this one, white foam core was placed under the piece to bounce light up and a vertically hung gray background placed in the back – with a gap of about four feet between. There are many ways to photograph ceramics; these are but a few.